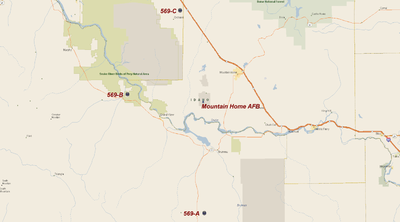 Mountain Home AFB is the home of the 366th Fighter Wing (366 FW), which reports to Air Combat Command (ACC). The mission of the 366 FW is to prepare Airmen and their families, professionally and personally, for expeditionary operations and foster an environment that promotes integration of all facets of wing operations. In addition, the 726th Air Control Squadron gives an air picture to the aircraft as they train. An active Idaho Air National Guard unit, the 266th Range Squadron, controls and maintains emitter sites within the 7,412 sq mi (19,200 km2) operational training range in southwestern Idaho. Crews started building the base in November 1942 and the new field officially opened on 7 August 1943. Shortly thereafter, airmen at the field began training U.S. Army Air Forces crews for World War II. The 396th Bombardment Group (Heavy) was the first unit assigned and its planned mission was to train crews for the B-17 Flying Fortress. However, before the first B-17s arrived, plans for the field changed and the 396th was transferred to Moses Lake AAF, Washington. Instead of training B-17 crews, Mountain Home airmen began training crews for the B-24 Liberator. The first group to do so was the 470th Bombardment Group (Heavy), which trained at Mountain Home from May 1943 until January 1944, when the unit moved to Tonopah AAF Nevada. The 490th Bombardment Group (Heavy) replaced the 470th and trained B-24 crews until it deployed to RAF Eye England in April 1944. The 494th Bombardment Group then replaced the 490th, once more training Liberator crews. The base was placed in inactive status in October 1945. 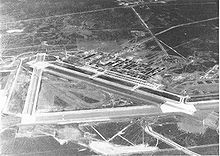 The base remained inactive for over three years, until December 1948, when the newly independent U.S. Air Force reopened the base. The 4205th Air Base Group, was activated on 12 December to prepare the newly re-designated Mountain Home Air Force Base for operational use. Three wings of the Air Resupply and Communications Service used the base in the early 1950s. In 1953, the base was transferred to Strategic Air Command which assigned its 9th Bombardment Wing to Mountain Home. The 9th relocated to Mountain Home AFB in May 1953, and began flying B-29 bombers and KB-29H refueling aircraft. The 9th began converting to the new B-47 Stratojet bomber and the KC-97 tanker in September 1954, keeping alert bombers ready for war at a moments notice and continuing its mission as a deterrent force throughout the Cold War years of the 1950s and early 1960s. In 1959, construction of three Titan missile sites began in the local area. The 569th Strategic Missile Squadron controlled these sites and was assigned to the 9th Bombardment Wing in August 1962. To prepare for the addition of missiles to its bomber forces, the U.S. Air Force redesignated the wing as the pp9th Strategic Aerospace Wing[[ in April 1962. A few years later, the Strategic Air Command mission at Mountain Home began to wind down, and in November 1964, the U.S. Air Force announced that the missile sites would be closed. In late 1965, the U.S. Air Force also began phasing out the aging B-47 bomber and announced plans to bring the 67th Tactical Reconnaissance Wing to Mountain Home. The 366th Fighter Wing (in various designations) has been the host unit at Mountain Home for over 35 years, following its return from the Vietnam War in late 1972. Before the 366th Tactical Fighter Wing's arrival at Mountain Home, the 389th, 390th, and 391st Tactical Fighter Squadrons had returned from South Vietnam, joined the 347th, and began converting to F-111A aircraft. For the first time since it left for Vietnam, the wing once again had its three original flying units. During 1969, a tenant unit began operating at the south end of the base, using part of the original SAC alert area, and about half of the Mole Hole alert facility, sharing the other half with an NCO leadership school from the main base. Det. 1, 320 BW carried out an alert mission with two B-52 bombers and two KC-135 tankers. The unit disbanded in the spring of 1975 and returned to Mather AFB. Operations continued unchanged for several years. The wing tested its readiness in August 1976 when a border incident in Korea prompted the U.S. to augment its military contingent in South Korea as a show of force. The 366th deployed a squadron of 20 F-111 fighters, which reached Korea only 31 hours after receiving launch notification. Tensions eased shortly afterward and the detachment returned home. In early 1991, the Air Force announced that the 366th would become the Air Force's premier "air intervention" composite wing. The wing would grow with the addition of a squadron of EF-111A Raven electronic warfare aircraft and a squadron of B-1B Lancer bombers to become a dynamic, five squadron wing with the ability to deploy rapidly and deliver integrated combat airpower. The air intervention composite wing's rapid transition from concept to reality began in October 1991 when Air Force redesignated the wing as the 366th Wing. The wing's newly reactivated "fighter squadrons" became part of the composite wing in March 1992. The 389th Fighter Squadron began flying the dual-role F-16C Fighting Falcon, while the 391st Fighter Squadron was equipped with the new F-15E Strike Eagle. These two squadrons provide Gunfighters round-the-clock precision strike capability. Following the terrorist attacks on 11 September 2001, the resultant initiation of Operation ENDURING FREEDOM (OEF), the 366th Wing once again got the call. While the 34th Bomb Squadron deployed to Diego Garcia as the B-1 component of the 28th Air Expeditionary Wing, the wing sent a Base Operations Support package to Al Udeid Air Base, Qatar, to transform the bare base into a fully functional airfield for large-scale combat operations. In October 2001, the 391st Fighter Squadron deployed to Al Jaber Air Base, Kuwait, while the 389th Fighter Squadron went to Al Udeid in November. Following the wing's return from Southwest Asia, the Air Force began consolidating its B-1 Lancer and KC-135 Stratotanker forces. This led to the reallocation of the wing's bombers and tankers. The 22 ARS' aircraft began transferring to McConnell AFB, Kansas, in May 2002 and the squadron inactivated the following August. The 34 BS' B-1Bs began moving to Ellsworth AFB, South Dakota, in June and the squadron officially moved in September. Following the departure of these assets, the Air Force re-designated the 366th as a Fighter Wing. With these changes, the wing's 10-year mission as the Air Force's only standing air expeditionary wing came to an end. A continued reconstruction of the 366 Fighter Wing was official with the 2005 base realignment, coinciding with the large scale integration of the 150+ F-22 Raptors. After the F-16 departure, Mountain Home AFB was chosen to become an F-15E installation because of its ideal training terrain range that is suited for air-to-ground, and air-to-air training missions. The base was the site of a Thunderbirds crash on 14 September 2003 in which no one was killed. Captain Chris Stricklin, flying Thunderbird 6 (opposing solo, serial #87-0327), attempted a "Split S" maneuver (which he had performed over 200 times) immediately after takeoff based on an incorrect mean-sea-level elevation. Similar in desert appearance, MHAFB is 1,100 feet (340 m) higher than the Thunderbirds' home at Nellis AFB near Las Vegas, Nevada. Climbing to only 1,670 ft (510 m) above ground level (AGL) instead of 2,500 ft (760 m), Stricklin had insufficient altitude to complete the descending half-loop maneuver. He guided the F-16C aircraft down runway 30, away from the spectators and ejected less than one second before impact. His parachute deployed when he was just above the ground and Stricklin survived with only minor injuries. No one on the ground was injured, but the $20 million aircraft was destroyed. Official procedure for demonstration "Split-S" maneuvers was changed, and the USAF now requires Thunderbird pilots and airshow ground controllers to both work in above mean-sea-level (AMSL) altitudes, as opposed to ground control working in AGL and pilots in AMSL, which led to two sets of numbers that had to be reconciled by the pilot. Thunderbird pilots now also climb an extra 1,000 ft (300 m) before performing the Split S maneuver. Mountain Home Army Air Field, 2 Dec 1943. Temporary inactive status, 5 Oct 1945. Mountain Home AFB is located at (43.049511, −115.866452), at an elevation of 2,996 ft (913 m) above sea level. It is in the western portion of the Snake River Plain, about 3 miles (5 km) north of C. J. Strike Reservoir, an impoundment of the Snake River (and Bruneau River). According to the United States Census Bureau, the CDP has a total area of 9.9 sq mi (26 km2), and 0.10% is water. It is connected to the city of Mountain Home by State Highway 67. As of the census of 2000, there were 8,894 people, 1,476 households, and 1,452 families residing in the CDP. The population density was 896 inhabitants per square mile (346/km2). There were 1,590 housing units at an average density of 160 per square mile (62/km2). The racial makeup of the CDP was 83.2% White, 6.9% Black or African American, 0.8% Native American, 2.5% Asian, 0.2% Pacific Islander, 2.7% from other races, and 3.7% from two or more races. Hispanic or Latino of any race were 6.5% of the population. There were 1,476 households out of which 76.4% had children under the age of 18 living with them, 91.9% were married couples living together, 4.4% had a female householder with no husband present, and 1.6% were non-families. 1.4% of all households were made up of individuals and none had someone living alone who was 65 years of age or older. The average household size was 3.40 and the average family size was 3.43. In the CDP, the population was spread out with 24.0% under the age of 18, 24.4% from 18 to 24, 49.7% from 25 to 44, 1.8% from 45 to 64, and 0.1% who were 65 years of age or older. The median age was 25 years. For every 100 females, there were 180.8 males. For every 100 females age 18 and over, there were 219.5 males. The median income for a household in the CDP was $31,634, and the median income for a family was $31,377. Males had a median income of $24,865 versus $20,664 for females. The per capita income for the CDP was $17,671. About 6.5% of families and 7.4% of the population were below the poverty line, including 9.1% of those under age 18 and none of those age 65 or over. ^ a b c "Thunderbird accident report released". F-16.net. Retrieved 3 April 2013. This article includes a link to the cockpit video of the ejection. 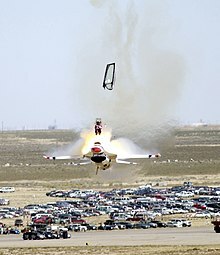 ^ "Thunderbirds jet crashes at show". Spokesman-Review. Spokane, Washington. Associated Press. 15 September 2013. p. A10. ^ Moffatt, Riley. Population History of Western U.S. Cities & Towns, 1850–1990. Lanham: Scarecrow, 1996, 96. 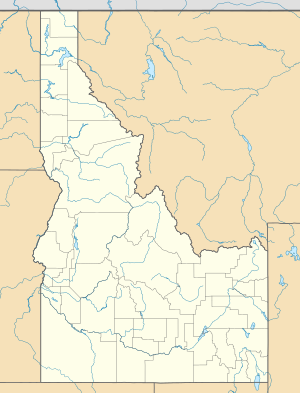 ^ "Subcounty population estimates: Idaho 2000–2007". United States Census Bureau, Population Division. 18 March 2009. Archived from the original (CSV) on 31 March 2009. Retrieved 17 June 2009. This article incorporates public domain material from the United States Government document "Mountain Home Air Force Base". Wikimedia Commons has media related to Mountain Home Air Force Base. This page was last edited on 23 February 2019, at 20:39 (UTC).